The reason we bring foreign workers into the country is because a lot of the odd jobs which are low paying is being refused by our countrymen. The low paying jobs are still paid with minimal wage because of the influx of foreign workers. 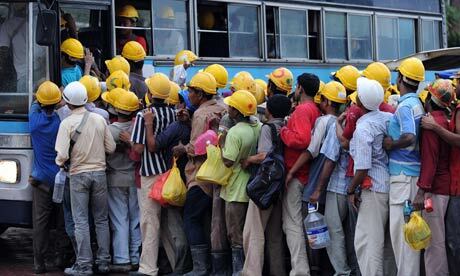 If no one is going to work that job, companies offer it to foreign workers because they are cheaper. However, if there's not enough foreign workers, the companies have no choice but to hike up the salary in order to attract locals. This in turn generates income for the common people and takes the minimum wage higher. The truth is, it's all about supply and demand. If there's not enough supply of foreign workers, ultimately the locals will gladly fill it up. However, this can only happen if locals are given adequate payment and remuneration based on current living standards. We should not pay our locals based on other countries' living standards. True, a foreign worker can work at a baggage loading terminal of a reputable airport for minimum wage because this is their short term solution to their economy crisis in their country. However, if there is no foreign workers in Malaysia, the job will have to be given to locals who will then demand a salary according to the current market. This in turn will benefit the economy and increase our living standards. Or the locals can go overseas and be treated like foreign workers in other countries plucking fruits or cleaning plates for a salary much better than a graduate in Malaysia.